This will be my last Reagan signed item. It's a nice 8x10 White House photo signed by Nancy and President Reagan. If I had to guess, I'd say it was signed in the early to mid-90s. 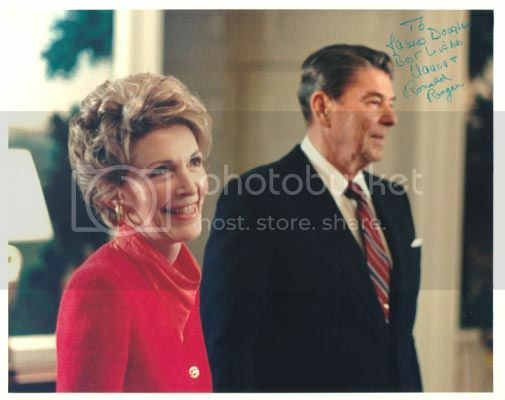 As many collectors have stated, the trick to getting Reagan to sign a photo in the mid-90s was to send it to Nancy and ask them both to sign it. I suspect that this is how this photo was signed. I obtained this from R&R auction a few years ago for a very reasonable price. I got this for a song while the bidding war erupted over a another item -- a "perfect pose" signed photo was "perfectly fake"!